Werner is a retired sociology professor living in Cobble Hill. 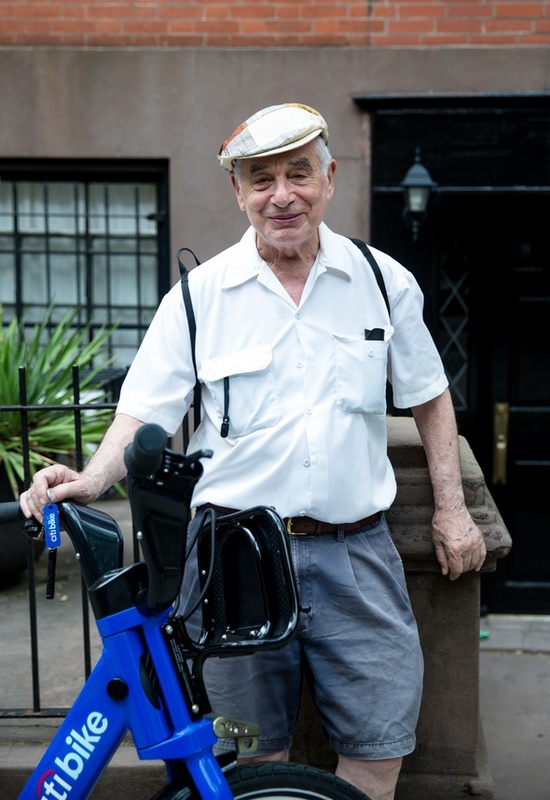 He signed up for bike-share to help him get around the neighborhood (his nearest Citi Bike station is a couple of blocks away in Brooklyn Heights). After seeing this, I seriously need to teach my mother to ride. If he can do it, so can she (she’s 74). Riding a bike at an older age, and learning to ride a bike at an older age are two completely different things IMO, because the latter often involves taking a fall or two. This guy is great. Can you adopt a grandfather? Great photo and writeup! I agree with Werner about the Henry Street bike lane and that it’s easier to bike than to walk. Also, I hope that NYC will become bike-friendly for the very young and the very old before I reach Werner’s age. Damned hipsters! Never enough bike lanes!! I love this series, Dmitry. I’ll have to remind myself that bike-share is being used by people like Werner when I read the Post stories about Brooklyn Heights cranks trashing Citi Bike docks. Why are there no citibanks in Harlem? Wouldn’t a great location be on 112th and Lenox Ave, City College, Columbia U?